Every few years or so, classical labels due their best to make the genre more accessible to younger audiences. Yes, a marketing ploy. But a marketing ploy that I've always agreed with. I don't always like the choices that are made, but the idea of spreading the word about some of the greatest musical pieces ever written, I completely agree with. 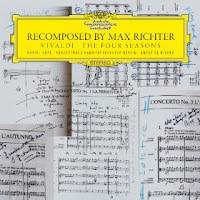 With the most recent entry into this realm, Max Richter's Vivladi: Four Seasons Recomposed, quite easily is one of the best and beautifully visionary approaches for a new generation. Richter, best known for his soundtrack work and some very intriguing minimalist electronic compositions, takes a bold approach to Vivaldi's classic benchmark. Previous entries in the ongoing Recomposed series (this is the sixth entry) have focused more on a modern electronic interpretations. Richter has decided to stay in the classical area and simply re-imagine the piece altogether. Richter brings a modern urgency to a piece that already embodies the highest degree of fervor. While the opening movement "Spring" brings the joy and rise of a new season it's second movement is what illustrates Richter's imaginative spirit. A slow, calm passage with accentuation by the emotional delivery of the Daniel Hope. The movement "Summer" could stand alone as its own album. Moving through both the peaceful and violent nature of what this season can bring, the final movement is brash and cinematic. In many ways it stays close to the original writings of the piece. And is sublimely turned on its head by the ambient outro. As you would expect the crowning (and probably most debated) piece would be "Autumn." Richter again uses the original theme but slightly turns it in ways most listeners won't notice. A delicate balance and very reverent. The orchestra perform with absolute grace and even exude an element of fun that is very audible. "Winter," another revered piece (heard on almost every jewelry commercial) is treated in a similar fashion. Scaling immense heights early but closing with a third movement that is absorbing and highly effective. A wonderful conclusion to a subtle yet invigorating re-interpretation. Max Richter has done a brilliant job creating an new atmosphere for a beloved and legendary piece. Bringing Vivaldi's Four Seasons into the modern age and making it exciting for new listeners. Recomposed is a highly recommend and demanding piece of music you should rush out and purchase--now.